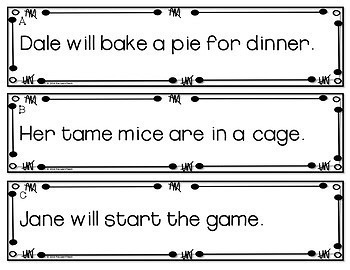 Are you looking for a versatile set of sentence strips that can be used for students who struggle with reading fluency? Do you have a limited time period to work on fluency, comprehension, phonics and sight words? Do your students need to work on sentence fluency with long vowel words, also known as silent e or magic e words? 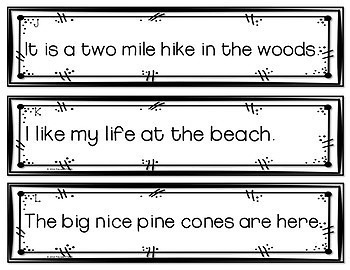 These sentence strips are a great next step between single word flash cards and longer reading passages. Students read 5 to 7 word sentences that have two target words in each of long a, i, o, or u. The rest of the words are sight words or easy to decode. As with any resource, preview it before using to see if there are any vocabulary words your particular students might not be familiar with, and then preteach or assist with pronouncing them. place them in sensory bin and have the students find them and record on the response sheets. For individualized use with students on the autism spectrum or other developmental delays, set up the desired number of cards in a work box. The cards can also be attached to a file folder with hook and loop tape and used as an individualized file folder activity. 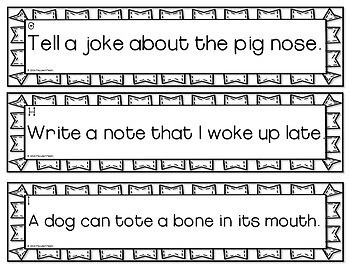 To use as a Read and Write the Room activity, hang the sentence cards in various spots in your classroom. Your students then read the room and record using one of the three differentiated response sheets. 3 differentiated response sheets to copy and write, trace, or illustrate. Be sure to check the PREVIEW for examples. 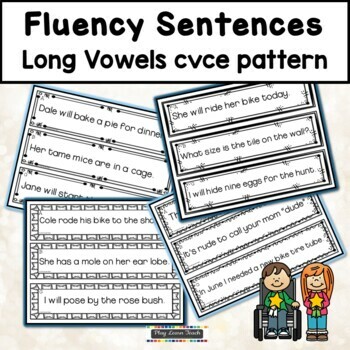 Check out the Fluency Sentences Long Vowel a Reading Intervention - it's a freebie and part of this complete resource.